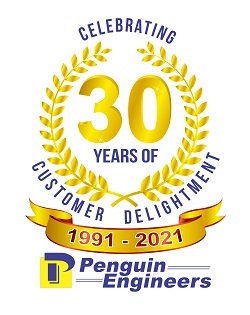 Penguin team is jubilant in stepping into the 25th year of its operations in July 2015. We acknowledge and appreciate all our customers, our employees and their families, external associates and our well wishers for their consistent support and encouragement through our journey in these 25 years. Penguin unveils its silver jubilee celebrations on 27 July 2015 in Coimbatore. Mr. Leigh Morrison, CEO of Ryco Hydraulics Pty ltd., which specialises in High Pressure Hydraulic Hoses and Fittings, operating on a global scale, head-quartered at Australia, was the Chief Guest in the occasion. Mr. Lothar E. Ignatzi, Managing Director of Mayer Braidtech GmbH, which is more than a century old organisation in the Braiding industry, took part in the celebration as an enduring business associate and steadfast customer. Dr. Fiorenzo Donetti, Managing Director - MacDue Srl, Italy & Director - Italindia Packplus Pvt Ltd., Coimbatore and Mr. A.V. Kate, Director, Unirub Techno India Pvt. Ltd., Pune were the guests of honor for the celebrations. Penguin's unwavering belief in 'Customer First' as a prime value of the firm. Penguin invites and honors its 'First Customers' of various models of its product, since the inception of the firm, as Special Guests during the occasion. 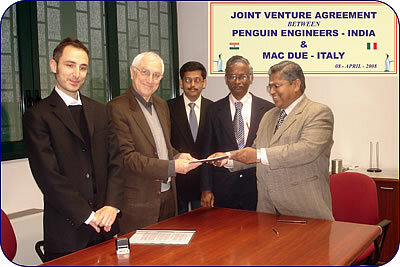 Penguin Engineers, Coimbatore, India & MAC DUE, Bologna, Italy have signed a MOU at Bologna, Italy on 08-April-2008 to start a Joint Venture Company in Coimbatore to manufacture the MAC DUE Shrink wrapping Machines in India and market directly in India / export on behalf of MAC DUE. MAC DUE - Bologna, Italy, are one of the well established and leading world-class manufacturer & exporter in Italy for nearly 26 years, of various models of: Total enclosure Automatic Shrink Packing and Bagging Machine with side sealing system for P.E. or P.P. film, Vertical semi-automatic case packer, Automatic sleeve wrapping machine, Two Reels Shrink Wrapping Machines etc., for packaging large industrial products in PE Film. Their clientele are over 4000 world-wide. Now PENGUIN ENGINEERS, Coimbatore can cater to the packaging needs of large industrial products of multi various Industries. Penguin Engineers have opened their new factory building on 16th March 2006. The new Production facility was inaugurated by Mr. LOTHAR E.IGNATZI, Managing Director, Mayer Braid tech GmbH, Germany in the presence of Mr. A.V. KATE, Director, Unirub Techno India. Pvt. Ltd., Pune and Mr. EDWYN RODRIGUES, Director, Batliboi Impex Ltd., Mumbai.